Top Secret: The Brachiosaurus Lives...at Dinosaur Corporation! Did you know that the Brachiosaurus can be kind of cute, too? We stock adorable Brachiosaurus dinosaur party birthday decorations, along with fearsome Jurassic neckties, dinosaur wallstickers, easy to apply (and remove!) wall decorations, baby Brachiosaurus pictures and more. Our Apatosaurus wooden skeleton kits are a fun and meaningful activity for the whole family, letting everyone participate in putting together an interesting and long lasting toy. With each piece carefully shrink wrapped for easy organization and sandpaper included, these can be painted for a more dramatic effect or left their natural wood color as well. Let your children choose! Our Schleich, Safari, Carnegie, Papo and Collecta Brachiosaurus long neck replicas are sturdy playthings for indoors and out, but did you know they�re also collectible too? Made according to exacting standards of accuracy endorsed by the Museum of Natural History, these are toys many families pass on from generation to generation, or gather as part of a larger collection to save and enjoy. 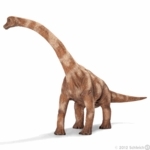 We know you�ll love our Schleich Brachiosaurus toy, made in heavy vinyl for kids age 3 and up. 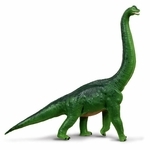 Did you know you can find high quality Brachiosaurus toys, puzzles, replicas, models, Brachiosaurus party supplies, birthday balloons, Carnegie dinosaurs, Schleich and Safari toys, dino dig excavation kits. Shop the BEST prehistoric themed dinosaur apparel, clothing, T-shirts, hats, shirts, socks, pajamas, school backpacks, toddler, boys and girls, kids, youth sizes, shoes and sandals, Jurassic bedding for children loving prehistoric world, also games, posters, dinosaur decoration, dinosaur toys, figures, party supplies, clothes, plush toys, inflatable toys, decoration, books, models, kits, gifts, T-shirts, youth, small, medium, large, extra large, adult sizes, dino dig skeletons, fossil fake bones, statue, wall stickers. Brachiosaurus decals, banners, posters, game, pictures, bedding, nightlights, accessories, educational books, birthday cards and gifts for kids and adults. Check out our website for frequent sales and specials. 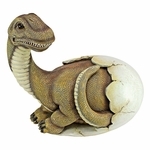 We make it easy to love shopping with Dinosaur Corporation, every kid�s favorite dino store. Giant Jurassic Brachiosaurus Dinosaur Wall Sticker, 78" x 32"
Brachiosaurus Cuddly Soft Plush Dinosaur Stuffed Toy, 15", 4pcs. Brachiosaurus Cuddly Soft Plush Toy Dinosaur Stuffed Animal, 15"
Giant Jurassic Brachiosaurus Statue Dinosaur Garden Sculpture, 215"
Green Brachiosaurus Dinosaur Soft Plush Toy 14", 3pcs. Jurassic Brachiosaurus Dinosaur Skeleton Statue 25"
Jurassic Brachiosaurus Dinosaur Statue 40"
Large Brachiosaurus Dinosaur Woodcraft Bones Skeleton Kit 20"
Large Brachiosaurus Wall Decal Sticker 52" x 21"
Large Green Soft Brachiosaurus Dinosaur Toy, 19", 3pcs. Wild Republic Large Brachiosaurus Plush Soft Cuddly Dinosaur Toy, 20"
Wild Republic Medium Brachiosaurus Plush Soft Cuddly Animal Toy, 15"